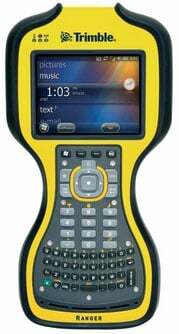 Trimble Ranger 3XE - 800 MHz processor, 256MB RAM/8GB Flash, VGA touch display, 58 key alphanumeric keypad, Windows Mobile 6.5 Pro, Bluetooth, GPS, SD slot, 5MP camera, 1D laser scanner. Color: Yellow. Includes charging kit and USB cable. The Trimble Ranger computer is designed to withstand the elements and survive the stress of working outdoors. The Ranger series is tested to rigorous military standards for temperature extremes, drops, vibration, humidity and altitude. The IP67 rating means the Ranger handheld is completely sealed against blowing dust and can survive immersion in up to a meter of water for 30 minutes. Trimble rugged computers have proven their reliability and lower Total Cost of Ownership over consumer-grade handhelds in the field with thousands of real world users. Multiple integrated features, a high-performance CPU, and a rugged design make the Trimble Ranger a very capable computing platform for mobile applications. The Ranger Software Development Kit provides software developers with a hardware-specific API to use in conjunction with Microsoft software development tools. The Ranger series has Windows Mobile certification and has undergone hundreds of hours of testing to ensure reliability and stability. The Trimble RGRABY-121-00 is also known as RGRABY-121-00	or RGRABY12100	.